Next to the chapel of St. John Fisher in Cambridge there is this stone with a very big maze engraved on the surface. I didn’t play to find the correct way because it was full of children playing around it. Maybe next time! The Ashmolean Museum is the World’s first university museum. Its first building was built in 1678–1683 to house the cabinet of curiosities Elias Ashmole gave Oxford University in 1677. The collection includes that of Elias Ashmole which he had collected himself, including objects he had acquired from the gardeners, travellers and collectors John Tradescant the elder and his son of the same name. The collection included antique coins, books, engravings, geological specimens, and zoological specimens—one of which was the stuffed body of the last dodo ever seen in Europe; but by 1755 the stuffed dodo was so moth-eaten that it was destroyed, except for its head and one claw. The museum opened on 24 May 1683, with naturalist Robert Plot as the first keeper. The first building, which became known as theOld Ashmolean, is sometimes attributed to Sir Christopher Wren or Thomas Wood. One of the first room that you visit after the main entrance is the one dedicated to the Minoic and the Ancient Greek period and we can find the Minoic figures there. Linear B is one of the Minoic scriptures. The script has about 90 signs ans a number of pictorial signs. Some of these old tablets have survived and they are the tablets that were baked in fires that destroyed the Minoic buildings. Linear B tablets as number 21 reconstruct the various stages of the textile production supervised in Knossos. This in a record of 58 castrated male sheep, 2 female sheep and a shortfall of 50 sheep, about 1375 BC, burnt clay. Can you guess the minoican figures for numbers 58, 2 and 50? Number 11 is a record of raw materials including wild goat horns probably needed for chariot building (c.1375 BC) and number 14 records issues of wool to women for the production of a particular type of cloth (c. 1375 BC). The first one is an Ancient Greek silver drachma found Kossos (300-270 BC) and the second is also a silver Knossos coin (300-200 BC) with a minotaur inside. There is another similar maze outdoors. These mazes were designed by the Polish painter Jan Henryk de Rosen (1891-1982). The cathedral of Amiens is tha tallest complete cathedral in France. According to Wikipedia, its stone-vaulted nave reaching a height of 42.30 metres (138.8 ft). It also has the greatest interior volume of any French cathedral, estimated at 200,000 cubic metres (260,000 cu yd). 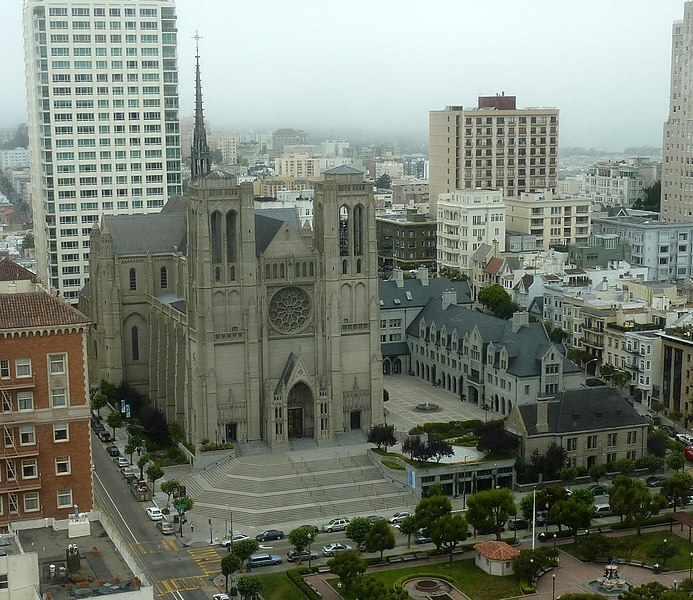 The cathedral was built between 1220 and c.1270 and has been listed as a UNESCO World Heritage Site since 1981. Although it has lost most of its original stained glass, Amiens Cathedral is renowned for the quality and quantity of early 13th century Gothic sculpture in the main west facade and the south transept portal, and a large quantity of polychrome sculpture from later periods inside the building. The reason why it is referred now is its maze (yesterday I began to talk about it) which represented the symbolic journey of salvation. The original maze is dated around 1288 and the modern path is a very good copy from it. I am sure that I am going to try to travel to Amiens to make a good picture of the maze! 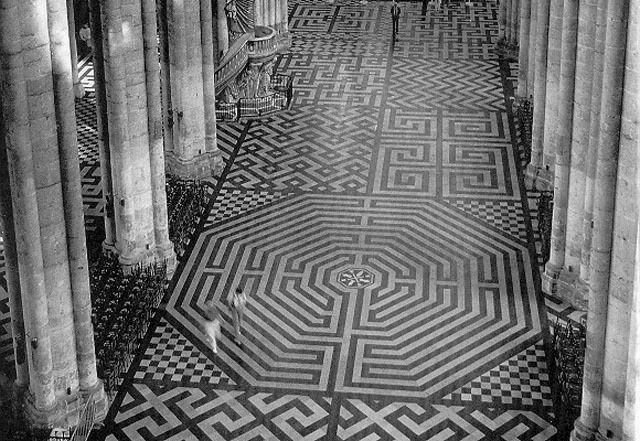 It was customary during the Middle Ages to insert in the floor of the nave of certain Cathedrals a maze or labyrinth of black and white stones or coloured tiles. These labyrinths were also known as “Roads of Jerusalem”, owing, it is supposed, to the fact that workshippers were accustomed to traverse the sharp stones of the maze upon their knees. Fig. 1, in the Cathedral of Sens, is on circular form, and was encrusted with lead. It measured 66 feet across, and the length of the circuit, with took an hour to traverse, was over a mile and a quarter. The maze at Saint Owen (fig. 2) was formed of blue and yellow tiles, and measured about three-quarters of a mile. 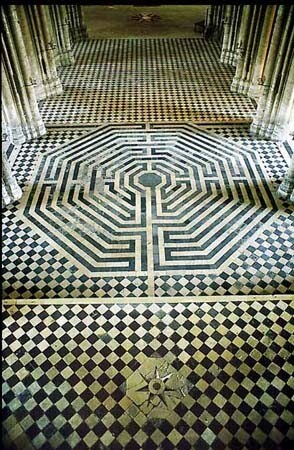 The labyrinth of Saint Quentin (fig. 3) was taken away in 1792, because of children playing the game of, “Who can get into it quickest?” disturbed the workshippers. The maze of Bayeux (fig. 4) is formed of black squares, bearing yellow riffings, roses, and armorial bearings. I think that this is a very interesting subject which must be studied better. I’m going to spent some time looking for information about some mazes inside European Medieval Cathedrals. Maybe tomorrow I’ll have some interesting information!